But aloud I said: “Of course, dear.” And we began to plan. To my astonished delight, contrary to all my previous thinking, the Stone Age diet not only proved effective in getting rid of Stef’s overweight, but was also cheaper, simpler, and easier to prepare than our regular mixed diet had been. Far from requiring more time, it took less. Instead of adding housekeeping burdens, it relieved them. Almost imperceptibly Stef’s diet became my diet. Time was saved in not shopping for, not preparing, not cooking, and not washing up after unrequired dishes, among them vegetables, salads, and desserts. Some of our friends say: “We would go on a meat diet too, but we couldn’t possibly afford it.” That started me investigating the actual cost of the diet. Unlike salads and desserts, which often do not keep, meat is as good several days later as the day it was cooked. There is no waste. I found our food bills were lower than they had been. But I attribute this to our fondness for mutton. Fortunately for us it is an unfashionable meat, which means it is cheap. We both like it, and thanks to our deep freeze, we buy fat old sheep at anything from twenty-two to thirty-three cents a pound and proceed to live on the fat of the land. We also buy beef, usually beef marrow. European cooks appreciate marrow, but most people in our country have never even tasted it, poor things. Conclusion: The Stone Age all-meat diet is wholesome. It is an eat-all-you-want reducing diet that permits you to forget you are dieting–no hunger pangs remind you. It saves time and money. Best of all, it improves the temperament. It somehow makes one feel optimistic, mildly euphoric. Epilogue: Stef used to love his role of being a thorn in the flesh of nutritionists. But in 1957 an article appeared in the august journal of the American Medical Association confirming what Stef had known for years from his anthropology and his own experience. The author of this book has also popularized Stef’s diet in England, with the blessing of staid British medical folk. PDF of Stefansson’s Fat of The Land. Ash Simmons has been part of our Zero Carb family for many years. For those of you who are interested in the Science behind a Zero Carb diet I highly recommend Ash’s Book Principa Ketogenica. 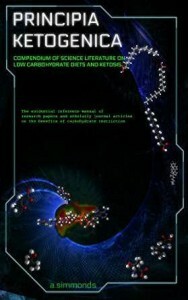 It is a wealth of information with reference to the actual studies regarding Low carb/Ketogenic diet/Zero carb diet. His Website “High Steaks” is also very informative and has great recipes as well. For more discussion on the Zero Carb way of life join us in our Facebook Group.